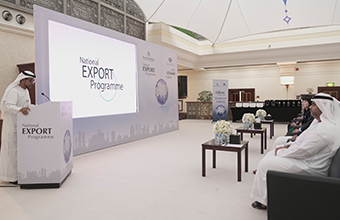 Abu Dhabi Fund for Development (ADFD), the leading national entity for international development aid, today announced the completion of a five-day simulation training initiative for its upcoming project, the National Export Programme (NEP). Aiming to bolster efforts to shape a diversified and sustainable national economy, the programme will contribute to enhancing the ability of national exports to enter and compete in international markets. Experts from the Export-Import Bank of Korea (KEXIM) helped in running the training. Earlier this year, ADFD appointed KEXIM to assist in setting up the framework of the National Export Programme in line with best international practices. To be managed by ADFD, the programme will support the goals of the UAE Vision 2021 with regard to implementing economic diversification, reducing dependence on oil revenues, and preparing the country for the post-oil era. Furthermore, it will align with the objectives of the Abu Dhabi Economic Vision 2030 that seeks to advance sustainable socio-economic development. For his part, Lee Seung-Keon, Director General of KEXIM, noted that the simulation training was successfully conducted in-line with best international standards. He also stressed that as a strategic partner, the Export-Import Bank of Korea is proud to have worked alongside ADFD in building a strong framework for the National Export Programme. In July 2017, ADFD commissioned the Korea Development Institute (KDI), a prominent Korean think tank, as an expert consultant to run a feasibility study to investigate the need for a UAE-based export programme. Since its inception in 1971, ADFD has financed development projects to the tune of AED83 billion in more than 88 countries around the world through concessionary loans and grants from the Abu Dhabi government.